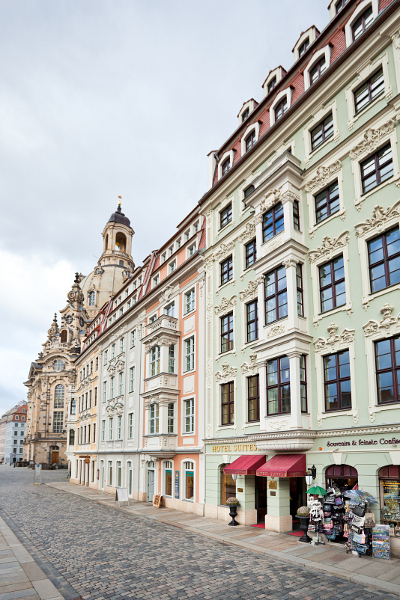 The Five-Star Superior Hotel Suitess is directly located at the Dresden Frauenkirche, only a few steps away from the Semper Opera House, the Dresden Zwinger and the residential Palace. Behind baroque facades – reconstructed true to the historical original – you will be enchanted by the comfortable single and double rooms, by the elegant suites, a noble wellness area and our exclusive restaurant. Our house has 21 rooms and 4 apartments in which you can rely on privacy, comfort and our amiable service. Our elegant rooms are furnished in the style of the Biedermeier period, and are supplied with exquisite materials and accessories. Our Hotel Suitess Dresden combines all advantages of the modern five-star standard with the luxurious atmosphere of past grand hotel times. A world full of comfort, to relax, enjoy and retreat – well, just to feel good. The Dresden private hotel Suitess is a member of Small Luxury Hotels of the World. We are a no-smoking hotel. Attended by passionate discussion, the Dresden Neumarkt square has been restored with an unprecedented effort since the end of the 1990s. Its reconstruction should, thus, be one of the largest operations of its kind in the world. And it is exactly in this unique setting where your private Five-Star Hotel “Suitess” is located. In a house that is symbol to Dresden’s eventful and contradictory history. Over long years, it has been meticulously and painstakingly restored to its former splendour. The building is part of the so-called Quartier II „An der Frauenkirche“, an eight building ensemble. Today you can enjoy the rich original pastel colours of the „Zum Schwan“ and „Zur Glocke“ houses bearing the street numbers „An der Frauenkirche“ 13 and 14. And as it was back then, the facades of the Rampische Strasse 1-7 impress with their masterly architecture.